ideal for reinforcing base coat renders and plasters when on mixed masonry. great for reinforcing corners of window and door openings to prevent cracking. used with Baumit MC 55 and Baumit StarContact as a reinforcement coat. It is designed for use with Baumit contact mortars and masonry base coat renders/plasters and can be used in all locations. Baumit StarTex is bedded in to a wet render/plaster. When reinforcing a thick-coat base coat this is done wet-in-wet by applying 2/3rds of the render and whilst wet trowelling in the StarTex. The final third of the render should be applied immediately. Each piece of StarTex should overlap adjacent pieces by at least 100mm in all directions. When applying to thin layer renders, again using a wet-in-wet process, the render should be combed first to ensure the correct thickness and then the StarTex trowelled in to it. A further 1-3mm of render should be applied over the StarTex to ensure the correct bedded depth. The render should be between 3 and 8mm in thickness depending on substrate and render. When using as corner reinforcement in thin layer renders, strip of mesh which are at least 300 x 300mm square should be diagonally applied in a tight coat of contact mortar, such as MC55, to the corners of openings before the main areas are rendered. If using a thick-coat render then this can be applied, as above, in with the render coat. 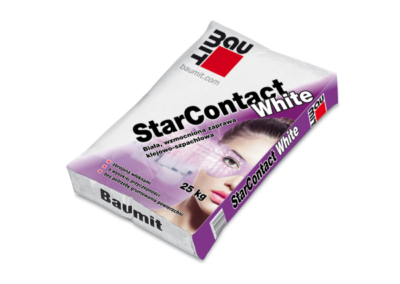 Product Data Sheet – Baumit StarTex mesh. Each 50 x 1m roll of Baumit StarTex mesh will cover around 45m2. Here you can see the Baumit StarTex Mesh being laid in to render on an EWI installation. On large open areas lay the mesh vertically as shown but on smaller, more awkward areas it can be laid horizontally. Always remember to ensure a 100mm overlap around all adges of the mesh pieces.